Hi Readers. Entangled Teen authors are stopping over today to share their books and do a fabulous giveaway. Don't miss the contest. It's near the bottom of the post. 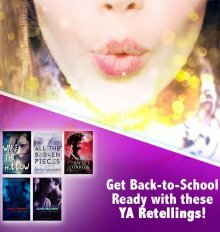 Recently, we asked several Entangled TEEN authors of YA Retellings the following question, "What book or story would you like to see updated for the young adult market? ", and where possible, we've shared their responses below with you! Olivia Twisted and All the Broken Pieces are on sale right now for only $0.99 , and next week, Such Sweet Sorrow is on sale for $0.99. The winners of this giveaway are: Kristy P., Beth E., Brooke B. - Winners to be contacted by the sponsor.